SV Instruments introduces the most robust tensiometers for all of your application in Surface or Interfacial tension measurement. We have Surface tensiometers with Methods like De Nuoy ring, Wilhelmy plate, bubble pressure, and drop volume. Which takes care of all your applications Static or Dynamic. Our tensiometers uses Peltier temperature control which is very small in size and does not use a chiller which generates vibration to spoil your measurement. Economical introduction into the world of tensiometry with the LAUDA Ring/plate tensiometer TD 1 C.
The TD 1 C units, whose technology has been completely revised and which bear a new design, offer even easier handling due to the handy remote control Command which has proven itself with LAUDA thermostats and measuring instruments. State-of-the-art processor technology allows extended documentation options. The sample stage of the easy to handle tensiometer can be manual adjusted. The measuring values are only displayed on the remote control. The evaluation of these values can be printed on an optional protocol printer. 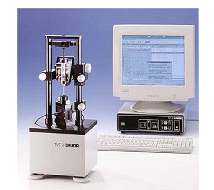 So the TD 1 C is a very flexible and highly precise measuring instrument. The perfect instrumentation for professional training. At the university's practical training in physics the robust and intuitive TD 1 C allows students to mesure exactly - and without additional corrections - the static surface and interfacial tension of numerous liquids according to the standardized methods of Du Noüy and Wilhelmy. Furthermore, they are able to determine the density according to the Archimedes' principle of liquid media. Now it is possible by a single, well-priced instrument to combine various experiments. With integrable stirring Peltier thermostating unit. Precise surface and interface tension at constant temperature. The new LAUDA Tensiometer TD 3 is used for the automatic measurement of surface tension and interfacial tension as well as for the determination of the density of liquids. The surface materials of the TD 3 are chemically resistant and suitable for almost all fields of application. An important application for the LAUDA TD 3 is the determination of interfacial tension in transformer oils for assessing the ageing, and consequently the insulating properties of transformer oils. Other typical applications are found in the beverage, food and petrochemical industries, with surfactant manufacturers and in pharmaceutics. The LAUDA Drop volume tensiometer expands the options for measuring the dynamic surface tension and interfacial tension of liquids. In a unique process, the system can be controlled under Windows with minimum loading of the computer, even when multi-tasking. New functions, such as individual drop measurement of up to 100 drops are now possible. 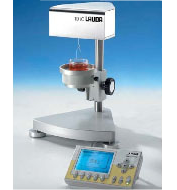 The LAUDA Tensiometer TVT 2 consists of a measurement desk and a control unit. The core of the electronic component is a microprocessor that controls the discharge speed, the counting of the encoder pulses, and the communications. LEDs and pictograms indicate the current status of the unit. Keys are provided for positioning the syringe plunger even in offline mode. During online operation, an RS 232 interface enables communication with the operating PC. Characterisation of the dynamic behaviour of surfactant molecules at the surface and interface within seconds or hours. High-precision measuring of interfacial tension in a very wide range down to 0.1 mN/m. Measurements on highly volatile and/or toxic substances, through gas-tight sealing of the system. High viscosity and skin-forming liquids can also be measured easily and rapidly. 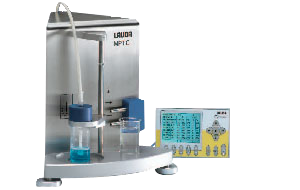 The handy LAUDA bubble pressure tensiometer MPT C also records fast surfactants in millisecond range. The new bubble pressure tensiometer MPT C has been added to the family of LAUDA tensiometers. As opposed to scientific research tensiometers - the final step has been taken for the full automation of dynamic surface tension measuring. Ultimate user-friendliness is achieved without having to take a detour via the PC. The extremely compact stand-alone device offers all the necessary features for the simple measurement of dynamic surface tensions in the laboratory or as a mobile device. Measurement of dynamic surface tensions in a time range of (one millisecond up to 20 seconds). Simple measurement of higher-viscosity and biological solutions. Thanks to the self-explanatory user guidance, the simple cleaning of the capillaries as well as the compact structure of the unit, the unit is especially suitable for the quality control of dynamically-critical surfactant solutions or for the fast determination of a surfactant in concentrations above the critical micelle concentration. The MPT C is robust, user-friendly and highly precise. Measurements are carried out completely independently by the user and documented along with the necessary settings. Thus complying with the strict specifications of the GLP guidelines. It is only by measuring the surface tension of extremely shortlived surfaces of washing-up liquids that the surfactant content can also be determined above the critical micelle concentration and be optimised directly in the process or a dosage formula be developed from it.